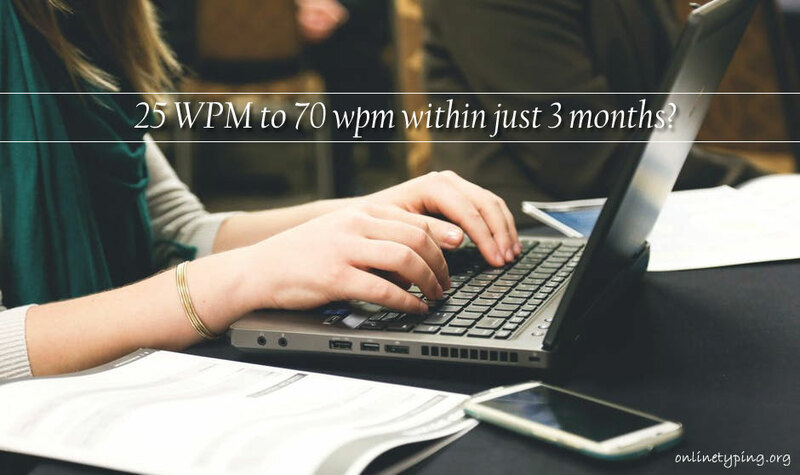 How do you increase your typing speed from 25 WPM to 70 wpm within just 3 months? Everyone wants to type fast but to speed up your typing you need to make a target. But is this possible to increase typing speed up to 40 WPM within just 3 months? The answer is yes. If you can follow the proper way and guideline you can easily increase your typing speed up-to 40 WPM within 3 months. Now the question is what way you have to follow to reach that mark? Something very interesting I noticed, when a person wants to type fast and put all the efforts to speed up their typing, they make mistakes. So I think the first thing that you should do is stop forcing yourself to type fast. If you practice regularly your speed will automatically increase. The second thing is the technique or the method you follow to type. Although there have several typing methods available, I always suggest following touch typing method to type. In the beginning, this may slow down your typing speed and you may make huge spelling mistakes but this will help you in the long run. You may also use the "free typing method" which is very similar to touch typing. You have to remember the keyboard layout but there is no any specification to press a particular key with the particular finger. So you may use your any finger to press any key. These are the two methods you may follow to type fast. I personally use and suggest touch typing for best performance. Another major thing that can influence your typing speed is your setting position. Always sit straight while type. This could make your typing faster up to 20%. The hand should keep parallel to the keyboard. This way you can practice for a long time without hurting your arm and back. Choosing the right keyboard is also very important. Although this can affect very little this little things is also helpful to increase typing speed. Choose PS-2 keyboard to practice typing. As PS-2 is a dedicated port for the keyboard the response time is very low compared to a USB keyboard. Before choosing any keyboard I suggest to read this article: Best keyboard to boost typing speed. These are the major factors which can boost your typing speed. But the most important thing is your constancy. If you practice regularly no one can stop you to reach 70 WPM speed within 3 months. Sometime this may feel annoying to practice typing continually so I suggest t play typing games these are also very helpful to speed up typing.